Built for urban life, but highly capable of handling the great outdoors, the 2017 Infiniti QX30 truly is the ideal blend between a stylish coupe and a practical crossover. Blurring the lines between coupe and crossover, the brand new luxury model, the QX30, from Infiniti is set to raise the bar and change everything we know about compact AWD vehicles. Built for urban life, but highly capable of handling the great outdoors, the 2017 Infiniti QX30 truly is the ideal blend between a stylish coupe and a practical crossover. Based on the Q30 platform, this QX30 boasts AWD, which immediately makes it attractive for our Canadian marketplace. 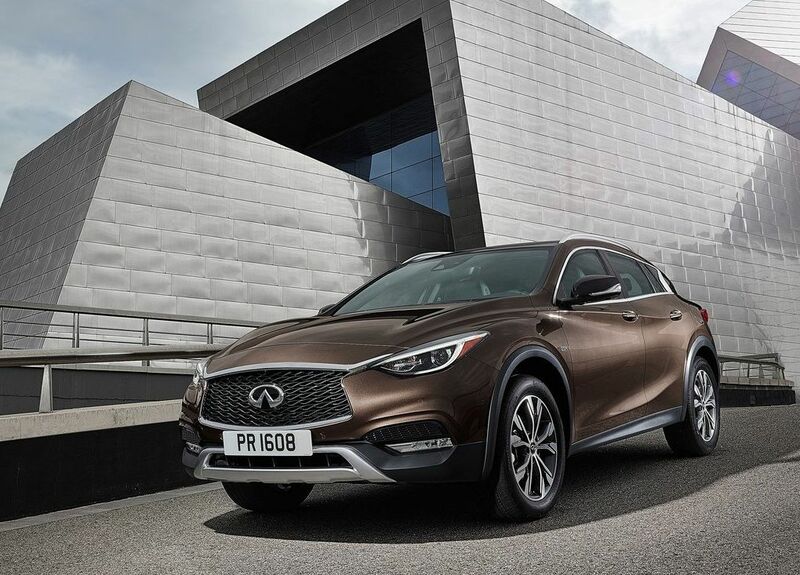 With 7.6” of ground clearance, the QX30 is more than just a hatchback version of the Q30, it really is an all-weather-ready prestigious compact crossover. In keeping with Infiniti’s new design language, the 2017 QX30 features striking bodylines and a muscular, defined stance. Large plastic fender flares over 21” wheels give the QX30 a ready-to-pounce position on the road, and the crossover’s powerful shape makes it look like it’s moving even when parked. The front grille also features a new open-mouthed look that’s in line with the vehicle’s athletic nature; taking in as much air as possible as it sprints from location to location. Under the heavily sculpted and honed athletic hood sits a 2.0L turbocharged 4-cylinder mill that’s estimated to produce somewhere between 220 and 250 horsepower. Of course, the 2017 Infiniti QX30 will undoubtedly feature the latest in the luxury brand’s onboard technology, including safety aids like intelligent cruise control coupled with an industry first Distance Control Assist (as seen in the QX50 model), as well as Infiniti’s Around View Monitor that enables flawless parking, no matter what the situation. And just like the already popular Infiniti QX50, this new QX30 is sure to feature Infiniti’s high-end interior amenities and qualities, with soft-touch materials, leather seating, heated front seats, as well as Bluetooth handsfree connection along with Infiniti Hard Drive Navigation which features Infiniti Voice Recognition and NatTraffic, along with SiriusXM satellite radio, all housed in a crisp, clear full-colour in-dash display that’s a breeze to navigate thanks to the large control knob and easy-access buttons. There’s no denying that the 2017 Infiniti QX30 is sure to be a hit with Canadians in the need for a prestigious compact luxury crossover. Checking all the appropriate boxes in terms of capability and amenities, the QX30 has it all including the right looks. To find out more about the all-new 2017 Infiniti QX30, head down to Morrey Infiniti today to speak to one of our experts about the new compact crossover, and don’t forget to sign up for a future test drive when they finally arrive in showrooms.